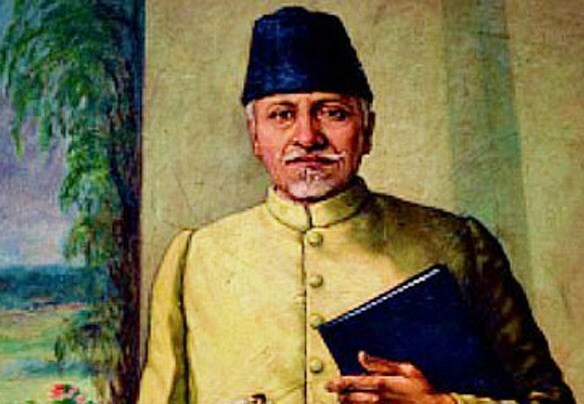 On November 11, 1888 Abul Kalam, better known as Maulana Azad, was born in Mecca and two years later his father came to Calcutta to consult a surgeon. Since then his family never went back and stayed in India. It is here that Maulana Azad was educated in traditional knowledge. He never went to any university and did not have modern education. He learnt English later. He had a great skill of writing and he wrote on politics, religion and theology. In politics, he was very active during the Khilafat Movement in the early 1920s. He rose to become the president of the Congress and was one of the longest serving presidents of the Congress from the late 1930s to 1946. During the period, he participated in the British Cabinet Mission Talks, showed his great skill and reached an understanding with the Muslim League. As per the agreement, the Muslim majority provinces would be given utmost autonomy and the central government would give all subjects, except defence, communication and foreign affairs, to provinces. Just after the conclusion of the British Cabinet Mission Talks, Maulana Azad was happy that the communal dispute had been solved through discussion and even the Muslim League agreed to the formula. Note that the formula reflected the spirit of Azad, that is, the sharing of power among different social groups. But his hope turned out to be a short-lived affair. Just before entering the Constituent Assembly, the newly- elected Congress President Jawaharlal Nehru gave a statement to the press that he was not fettered by the Cabinet Mission agreement, contradicting his own party and creating suspicion in the minds of Jinnah, his Muslim League and a considerable section of Muslims. Maulana did not have much hope from the politics of Jinnah but why did Sardar Patel become supporter of the Partition? Why did Nehru refuse to accept Maulana Azad’s request that the Partition was not the solution to the communal problem? But the most shocking for Azad was the lack of will shown by Mahatma Gandhi at the last moment to oppose the Partition. The message of Maulana Azad is undobtedly sharing of power as opposed to the concentration of power at one place. He also appealed all through his life to rise above the communal prejudice. It was the same communal prejudice which was operating in the minds of top Congress leaders when Syed Mahmood and Mr Nariman, a Muslim and a Parsi respectively and the most deserving Congress candidates, were rejected. It happened in 1937 when the Congress came to power in Bihar and Bombay provinces. Both Rajendra Prasad and Sardar Patel worked to remove them in their respective province and ensured that Hindu Congress leaders should grab the post of chief ministership. Maulana Azad then believed that the Congress nationalism had not become mature to rise above communal consideration. In spite of this, he was hopeful of the bright future for Muslims post-Partition and he appealed to them not feel unsafe in India where they lived for centuries. Ironically, our governments have opened university and library after his name and launched several schemes after him and even posthumously conferred on him the highest civilian award Bharat Ratna in 1991/92. Despite that they have never tried to follow the real message of Maulana Azad. On his coming birthday, we should ask our government and leaders about why the representation of minorities is going down with each passing days in Parliament, legislative assemblies and public and private institutions. Are we really paying homage to Maulana Azad when the BJP formed a central government with full majority in 2014 and did not ensure victory for a single Muslim candidate on its banner? How could the same party not give a single ticket to Muslims in UP and still managed to win overwhelming majority? Not to talk of a communal party, even Maulana Azad’s own Congress, which has been in power for several decades with the overwhelming support of Muslims, seems prepared to abandon the Muslim cause. It is, instead, trying to project itself more concerned about the majority Hindus. This shows how the Congress has deviated from Maulana Azad’s message as it is desperate to play soft Hindutva.